Raven introduced these locomotives in 1913 to haul light express passenger trains over short distances. After the initial order of 20 locomotives, a second order was placed in 1914 but was cancelled due to World War I. 25 more engines were built between 1920 and 1922. The H1s mainly worked the coastal trains between Saltburn and Scarborough, as well as fast residential services in the Leeds - Harrogate area. Despite their speed, power, and compactness; the H1s were never a very popular class. 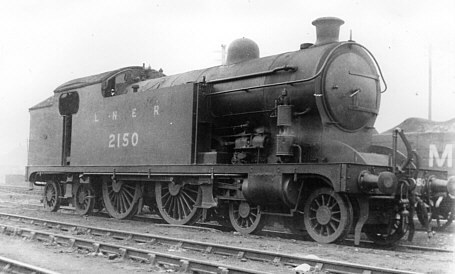 The Great Central Railway (GCR) chose a 4-4-2 design and then the A5 4-6-2 design, for similar duties. After Grouping, the LNER worked the A5s alongside the H1s. It is thought that this led to direct comparisons resulting in the decision to rebuild all of the H1s as A8s. Rebuilding started in 1931, and was completed by 1936. Heating Surface: Total: 1252.974 sq.ft. All of the H1s were rebuilt as Class A8s, and none survived into preservation. DJH produce a whitemetal kit of the H1 for OO gauge (4mm scale). Thank you to David Hey for the photograph of H1 No. 2150.